This year, being the 50th anniversary of the Beatles’ Yellow Submarine LP and animated film, we’ll see some official Apple-backed activities to mark the occasion. There’s to be a new graphic novel adaptation of the film story from comic-book artist, writer and editor Bill Morrison. This will be released on August 7 and is available for pre-order now from Amazon US and Amazon UK. See more on the background to the book here. 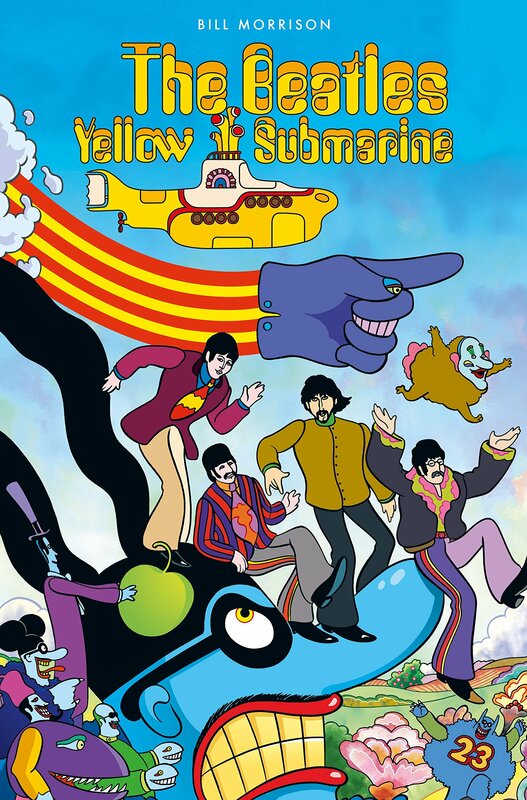 Also, The Beatles official site today also announced that, in the UK and Ireland at least, Yellow Submarine will be making a return to cinemas for one day only. It’s planned to show the film in multiple locations on July 8. Tickets go on sale from April 17. More details about this here – and you can keep up with the event on a new Yellow Submarine Film Facebook page. The company has already issued two Sgt. Pepper turntables (in Drum and Limited Edition versions); a Beatles 1964-themed player; plus a George Harrison commemorative model. No further details about availability or pricing of the Yellow Submarine model are available yet. This entry was posted in Beatles, Beatles Collecting and tagged 50th anniversary, Beatles, Beatles Books, Beatles Collecting, Yellow Submarine by beatlesblogger. Bookmark the permalink.